This website has been put together by the Underwood family. We have lived in Caleta de Fuste since 2003, and came on holiday here prior to that. The aim is to present our personal impression of the resort, and to help promote Caleta de Fuste and the island of Fuerteventura. Caleta de Fuste, or El Castillo as it is also known, is one of the newer resorts on the island. It is situated 8 km (15 minutes) south of the island’s airport on the east coast; and 12 km south of the capital, Puerto del Rosario. 30 years ago there was very little development in Caleta de Fuste, but the resort has grown steadily since that time. The resort is centred on a large beach, which has recently undergone a regeneration scheme, that was finished in March 2017; and a small pleasure boat harbour. 1 km to the south there are three man-made sea lagoons and beaches in front of the Sheraton Hotel, the Carlota Hotel and the Atlantico Commercial Center. There are a large number of restaurants, serving international cuisine; a range of bars, and a selection of shops and small supermarkets. The holiday accommodation ranges from 2 key self-catering apartments to 5 star hotels, with a total of around 36 apartment complexes and hotels which provide around 12,000 tourist beds. There is also a range of apartments and villas which are let out by private owners. The resort has 3 main areas. 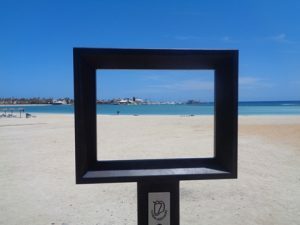 Central Caleta is located between the main road and the beach, and is close to the beach and harbour. 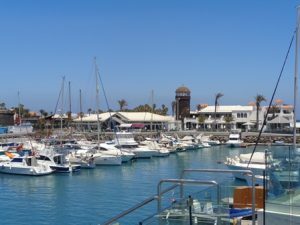 ‘Uphill’ Caleta is on the lower and middle slopes of Montaña Blanca, and southern Caleta is located around the Atlantico Commercial Center and the two golf courses of the Fuerteventura Golf Club and The Salinas Golf Club. 2 km to the north of Caleta de Fuste is Costa de Antigua, or Nuevo Horizonte as it was formerly known. This is a residential and tourist area, with a few local shops and restaurants/bars. 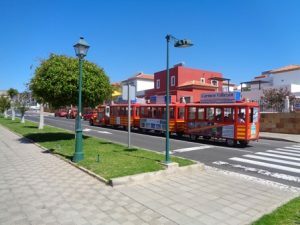 Caleta de Fuste is known to be ideal for families and those looking for a quiet and relaxing holiday; and is an all year round holiday destination. with tourists from Spain, the United Kingdom, France, Ireland, Italy, Germany, Scandinavia and other European countries. 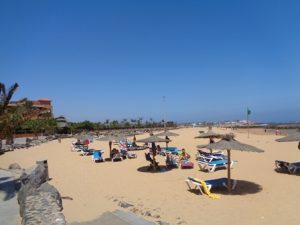 Caleta de Fuste is very much a modern tourist resort. Prior to the 1980’s there was little development and so there is little historical or cultural legacy. There is a small castle, now incorporated into the Barcelo Club complex, near the harbour. The castle is called San Ventura and was built in 1743. It was built to defend the Caleta de Fustes cove from pirate attacks on the merchant ships that operated out of it. The majority of the development in the resort has happened since the late 1980’s.